I’m a sucker for a new gadget. My kitchen is stuffed full of ‘must-have’ equipment that’s used with great enthusiasm until the next thing comes along. It’s been years since I used my coconut scraper-outer and it took me a while to figure out what the metal thingy was that I found in the back of a drawer recently. It was a croissant cutter. I never used it. It was given to me by a friend who shares my weakness. She’s also given me an asparagus cooker, which was much more useful; and a pair of pink onion goggles, which just made me look silly. Yesterday, I fell for a new one. The nice people at La Boca Loca invited me to a cooking demo to celebrate the first birthday of their Wellington restaurant. La Boca is the best little Mexican in the coolest little capital in the world. The food is great, the atmosphere is fun and it serves the best range of top-flight tequila I’ve ever come across. The tequila may have had something to do with my latest ‘must-have’ enthusiasm, but I also blame chefs Chris Martinez and Will Mitchell for inviting me into their kitchen and showing me how they make up to 300 tortillas a night with a gorgeous cast iron tortilla press. It’s an amazing device. 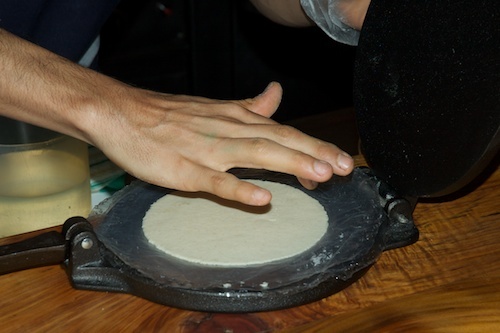 You roll out a golf-sized ball of masa dough, pop it on the bottom plate, pull the top plate over and press down. Voila! A perfect 3mm thin tortilla ready for the pan. It’s a rugged looking machine; the sort of gadget that must have been in use for generations. I imagine every Mexican kitchen has one. 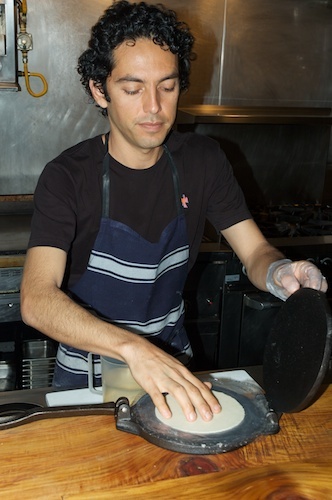 As I watched Chris make tortilla after tortilla, I started fantasising about making my own. I could take a press down to our boat shed in the Marlborough Sounds, buy a sack of masa flour and get in a load of tequilla. By the time Chris had finished pressing his tortillas, I was having a party to which everyone in our bay was invited. I had passed the point of no return. I had to have one. But where in Wellington would you find a tortilla press? Ontrays, of course. Steven Shekter’s shop has everything. Last time I was there, I nearly bought a strange looking vessel that you use for brewing mate tea. Steven kindly talked me out of it and suggested I try the tea first. Anyway, Steven and I have been tweeting and he’s put aside a tortilla press with my name on it. I’m planning to pick it up tomorrow and introduce it into my kitchen where I can confidently predict it will replace the pasta machine on my bench top. Until the next thing comes along.